We live in a world that has practically dedicated itself to tearing us down; it’s not that everyone in the world is evil or something, there are plenty of beautiful souls out there. The problem is that, whether or not it’s intentional, things such as social media, television, and even some music have convinced us that no matter what we do, we will never be good enough. 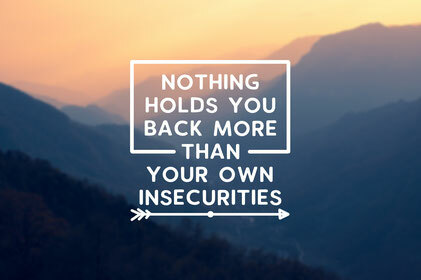 It doesn’t matter how confident someone appears to be, they have at least one insecurity. So why do we feel so alone when we step on our scale? Why is the bathroom mirror such a devastating thing? Why are we confined to these numbers and stereotypes that never seem to leave us alone? The first piece of the puzzle is that we, as a population, believe in the stereotype that men must always be confident and never have insecurities. In doing this, we isolate men from women in a way, making men think that they cannot show any dislike towards themselves and causing women to feel that they are even more alone in their insecurities. The fact of the matter is that men do have insecurities. Some will admit this to you, some will not; either way, it rings true. One of my best friends is a guy, and although he was reluctant to admit it at first, he feels as though he constantly has to be perfect. Society tells men that they cannot have feelings, fears, or faults; they are made to believe (from a very young age) that they have to be the biggest, the strongest, the toughest, and the most attractive. This is a complete lie. Guys, if you’re reading this, take some advice from a young woman: any girl that is worth dating will not care if you are super buff or how tall you are. Yes, she may appreciate it if you go to the gym or something, but it probably isn’t her main concern, so try not to worry too much. Although some may find it hard to believe, men are human beings and they have…wait for it…feelings. Who would’ve thought? Secondly, we have to talk about the more commonly discussed (but still somehow ignored) insecurities of women. Here’s the thing: society has always somehow found a way to make women feel insecure, even when they’re total knockouts. For example, the two types of beauty that we’re seeing right now: being curvy and having a thigh gap. These two standards are on opposite ends of the spectrum, so if you’re one then you’ll probably be told that you should be the other. Don’t get me wrong: all body types are beautiful in their own way, so I’m not trying to shame my fellow girls in any way (you do you boo, you’re killing it!) I’m just saying that we don’t exactly consider other body types; take me for example. I’ve been described as having an “athletic build,” which makes sense considering I was in a sport for three years. Still, I feel incredibly insecure about my body type at times, realizing that my wide shoulders don’t match up well with my narrower waist. Do you know how hard it is to find a shirt that fits me well? The point is, we expect ourselves to look like models and Hollywood actresses when that is completely unrealistic. I would like to mention that of course it’s possible to eat healthy and exercise, but these famous women usually have personal trainers and the money to buy fresh produce every week. Again, not shaming them: if I had the money for these things, I would be a size four too! But let’s be honest: chicken nuggets, fries, and a soda are way cheaper than a salad and a water. Guys, I’m about to be in college, so I don’t have much extra money to spend right now; looks like it’ll have to be chicken nuggets or a week-old banana. Third, we have to understand that insecurities are not just those concerning weight. Don’t let me confuse you; weight is a huge insecurity of many people, that’s why I spent a whole paragraph discussing it. But so many people are insecure about their hair color or texture, their freckles or lack thereof, their lack or excess amount of muscle, etc. These insecurities are completely normal, and I promise you, they’re a lot more common than you think. What you have to remember is that you will never truly see yourself the way that other people see you. It’s been proven that we tend to see ourselves in a much harsher light than we see others; similarly, others see themselves in a way harsher light than they see us. For every brunette wishing to be a blonde, there’s a blonde wishing to be a brunette. For every girl with red hair and freckles wishing for flawless skin, there’s a girl with flawless skin wishing she had red hair and freckles. Plenty of guys want to have muscles, plenty of guys with muscles don’t care anymore that they have muscles. We waste so much time worrying about what we don’t have that we forget to appreciate what we do have. We have people who think we’re beautiful, even on our worst days. We have people who love us even when we’re not worth loving, and we have people who are there at the drop of a hat even though you know for a fact that they’re always busy. I know that talking about insecurities and how common they are won’t erase them from your mind; that’s just not how this whole “being human” thing works. But you must remember that even on your worst days, you are beautiful and loved; even when you feel the rain pouring on your back, there will come sunshine that will warm you up again. And even though you may not feel good enough right now, it doesn’t mean that you aren’t. If you’re around people that make you feel worthless, get away from them and start hanging out with better people who pick you up when you’re down. 2019 is just starting, and although it won’t be easy, make this the year that you at least try to see yourself through the eyes of your loved ones; you might just be surprised at what you see.